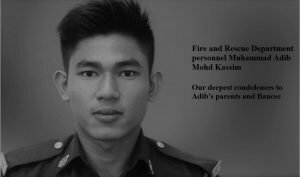 The late fireman, Muhammad Adib Mohd Kassim, was injured in November 2018, and rushed to hospital, then placed in intensive care, after the Sri Maha Mariamman Temple riots. He was doing his job, to control the blazing cars, stop the fire from spreading and protect people and property. The manner in which he received his injuries is under police investigation. Some people claim he was beaten up by rioters. Others claim he was hit by a reversing fire engine. The post mortem, conducted after his death, in December, may disclose the extent of his injuries. It may also reveal if the injuries were caused by a beating, or by being crushed by a large vehicle. When someone is placed in the ICU, he can only receive a maximum of two visitors, usually only family members. This ruling is strictly enforced, and they cover visiting hours, hygiene, the patient’s looks and behaviour, the sophisticated equipment, the unfamiliar sounds. Visitors can get in the way of medical staff administering treatment. The patient needs to rest and recover. Visitors tire the patient and spread infection. Why were the rules broken? So why did the hospital allow a succession of visitors, mostly non-family, from Sultans to senior politicians and disgraced kleptocrats, to visit him? How did this serve Adib? Are they members of his family or his next-of-kin? I bet Adib’s family had no say in this matter. When the celebrities visit, they are accompanied by their entourage of bodyguards, aides and the press pack. This is not good for the patient. The celebrities are like the despicable rubber neckers who gawp and gaze at injured people, in a traffic accident, and slow down traffic or get in the way of the emergency services. 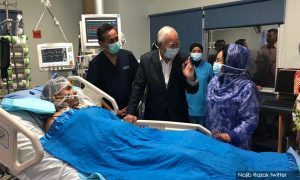 The medical staff, the hospital board and family members of victims, should protest against this idiotic Malaysian practise of showing-off one’s mock caring attitude. Or, are they afraid to resist the VVIPs? Only close relatives, like Adib’s parents, siblings and fiancee, should have been allowed to visit him, two at a time. This charade and circus should end now. The VVIPS, celebrities and former ministers take publicity photos with the victims, to show their mock compassion. They are insincere and only want to look good in the eyes of the public. The people who authorised these visits should be sacked. Does the Health Minister agree? The management must be sued for derilection of duty and professional negligence. Adib’s dependents must sue the hospital for the above. 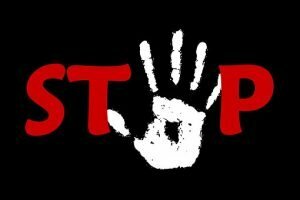 The ICU is a sterile place because all the patients there are vulnerable to infections which can and will kill them. 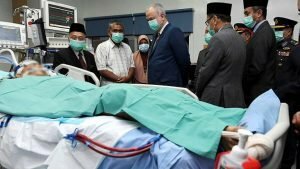 Adib’s death is most certainly due to the fact that the ICU became a “dirty” place(medically speaking), placing him under danger of infection brought in by the hordes of visitors daily. Most certainly he died of a severe pneumonia. And caused by the bacteria and viruses brought in by the hordes of visitors. Just look at the photograph. He is in coma and surrounded by half a dozen onlookers. This is a shame on the hospital and the management. Foreigners will see this and convulse with horror. And they will say – “this is Malaysia after all”. 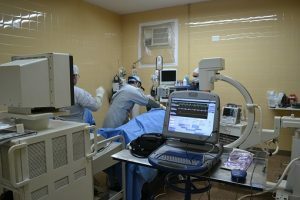 And for the other patients, if any of them suffered any severe complications due to infections, they can also sue the hospital AND the government. I am thoroughly ashamed. Why does the hospital management allow this to happened !!! This article is based on flawed premises.